A few months ago Cara over at Me? A mom? showed off a lovely little pincushion that she had received as part of Pay It Forward. In turn she was to make something for the 1st three commenters. I was quick to respond and ended up receiving this little pouch a couple weeks ago. 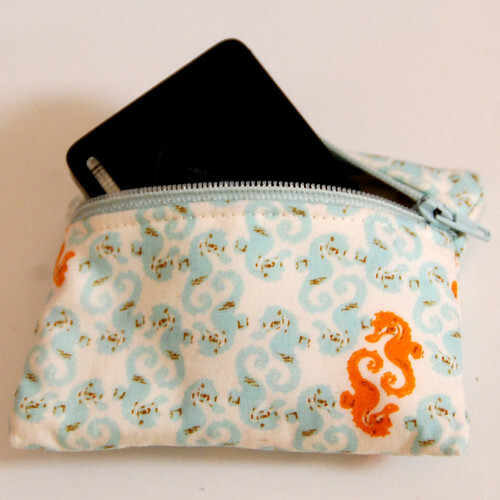 It's not just cute (with precious Mendocino fabric! ), it also happens to be the PERFECT size for my little camera. I had tried to make many camera pouches and none of them were right. And this one is. I carry it with me everyday. Today is my birthday. Still under 30, but getting closer. I thought that today would be a good day to find the next 3 people to pass it on to. It's simple: the first three people to leave a comment will receive something homemade from me (it's a surprise, meaning I haven't made it yet!). In turn, you must each commit to offering a 'Pay It Forward' gift on your own blog to 3 other people who must then offer to 3 others, etc. You have a year to complete this challenge. Also, I got some very exciting quilting news this morning! So far an excellent day! What a great idea! And that pouch is just adorable!! Oh, and happy happy birthday!! Love that! Does it count if I post it on my FB? I don't have a blog! I can do that! International OK? Pouch is so cute, perfect camera case! What a great idea. Too bad I'm a little slow this time. Maybe I'll do the same thing on my birthday! What a cute little pouch! Happy Birthday!! Happy Happy Birthday - my lil man told me yesterday that 37 is a very high number and that Grandmas number (64) is closer to 100 than Mummys - bless him! That is such a cute pouch! And what a fantastic idea. Hope you had a fabulous birthday!! Happy Brithday! I would love to hear your fabulous quilting news!